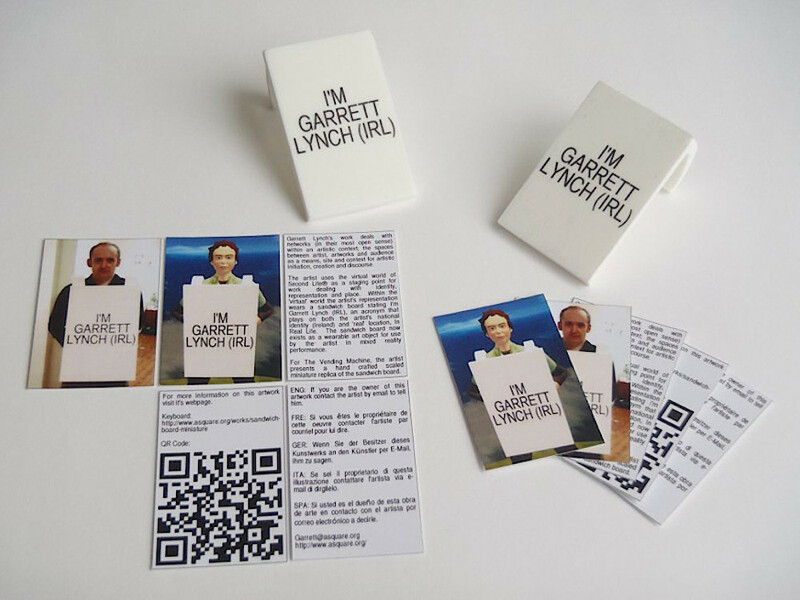 Above: Images of the sandwich board miniature replica. Click to view. The artist uses the ‘virtual’ world of Second Life® as a staging point for work dealing with identity, representation and place. 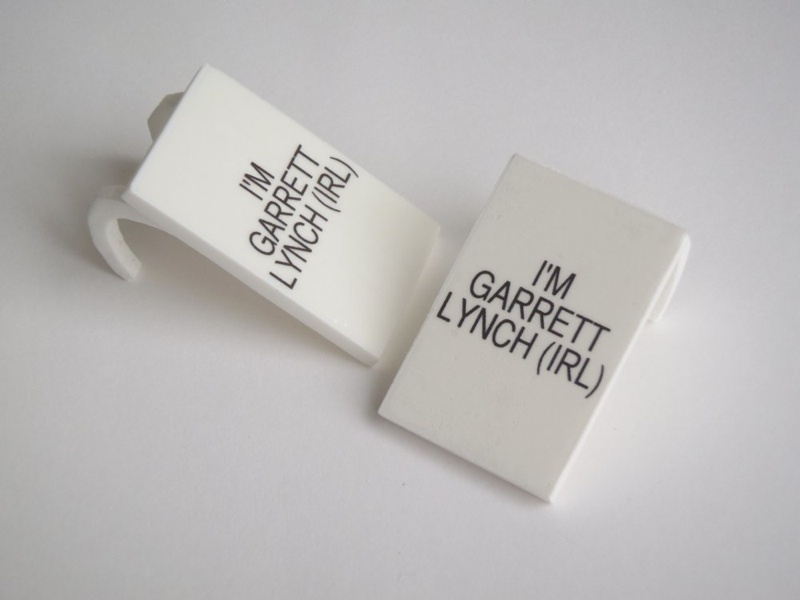 Within the ‘virtual’ world the artist’s representation wears a sandwich board stating I’m Garrett Lynch (IRL), an acronym that plays on both the artist’s national identity (Ireland) and ‘real’ location, In Real Life. The sandwich board now exists as a wearable art object for use by the artist in mixed reality performance. 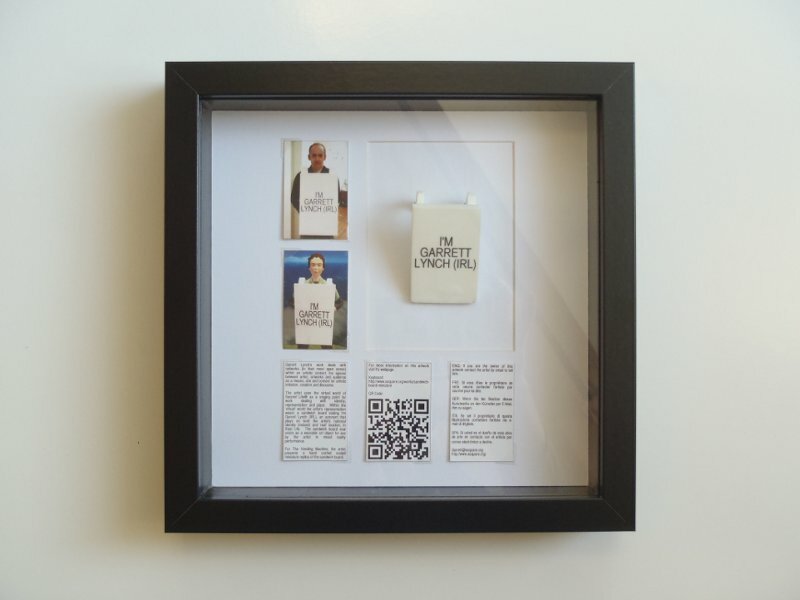 Sandwich Board – Miniature Replicas are two handcrafted scaled miniature replicas of the sandwich board, both mementos of the artists work in ‘virtual’ spaces made ‘real’ and a toy sized version of the life size sandwich board. The sandwich board has moved from the ‘virtual’, the original created for the artists representation, to the ‘real’ for the artist himself and now finally to a miniaturized ‘real’ version perhaps destined to be worn by an action figure, a representation in its own right. Above: Flickr slideshow documenting making the replicas. View on Flickr. The two vending machines supplied by Luca S r L become dispersers of transparent spheres, that can be compared to greenhouses, where the metaphoric growth of an idea is linked to the nurturing, development and growth of a plant, where chance intervenes to determine the outcome. Each sphere represents the lume (light), a world, an artist, a creative seed and will contain an original piece of diverse artwork produced by both emerging and established artists. Through the game of interaction and the inherent chance of the machine, an automatic distributor, an exchange takes place for both the artist and receiver of the art work. Playfulness is essential to creativity and quintessential to art. Through this installation an artistic exchange could opens new dialogues and ideas in a global context, amongst differing cultures, territories and landscapes. and a card addressed to the new owner with contact details for the artist. If contacted by the new owner of the replica exhibited the artist will provide the owner with provenance and credit as owner on this webpage. The Vending Machine installation/exhibition was sited at two prestigious locations in Venice, Galleria Perela and Serra dei Giardini from the 14th to 30th of September 2011.